The Page of Swords shows a young man standing with his sword pointing upwards to the sky. His body and the sword lean in one direction, but he looks the other way as if to see what else is happening around him. A breeze blows through the young man’s hair, and the clouds behind him appear to dash through the sky, bringing dynamic energy to the card. The ground on which the Page stands is green and fertile, suggesting that the Page’s ideas are likely to bring positive change and forward movement. The Page of Swords is full of energy, passion and enthusiasm. When this card shows up in a Tarot reading, you are bursting with new ideas and plans for the future. You may be excited about starting a new project, pursuing a new approach or learning something new. You have so much energy that you feel as though you could do almost anything – and you can! The challenge, however, is whether you can keep it up. As with all Pages, the beginning always looks promising, but you need something else to follow through and keep up the pace. The Page of Swords often emerges when you are exploring a new way of thinking – a new idea, a new perspective, new knowledge, or a new technique. You have a curious mind and a thirst for knowledge. As you explore this fresh way of thinking, you are asking lots of questions and gathering as much information as possible. You are also very much in the exploratory phase and not mastery. You may be prone to making mistakes along the way, but your curiosity means that you are eager to learn from your slip-ups. 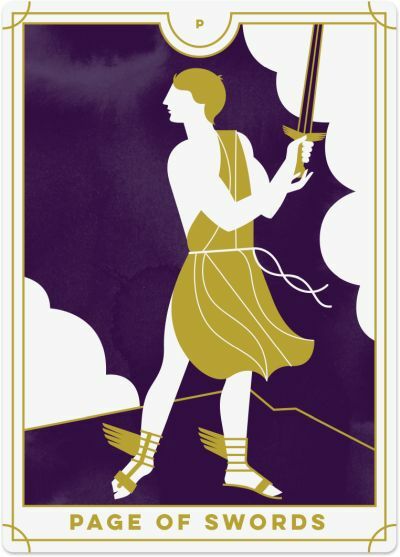 As the Swords relate to communication, the Page of Swords suggests that you are exploring a different way of expressing yourself with others and communicating your ideas and opinions. You may be drawn to public speaking, writing a book or a blog, starting a podcast, or being more vocal on social media. You are a natural communicator and ready to take the next step to share your message with the world. Again, this is the exploratory phase, so be open to new ways of expressing yourself and discovering where your inner talents lie. If you are looking for a sign to move ahead with a new project, the Page of Swords says, ‘Go for it!’ There will always be challenges with whatever way you choose, and not everyone will be thrilled with your choices, but when it comes down to it, you need to follow your passions and go where your true energy lies. This Page encourages you to move forward and to get the wheels in motion, despite any challenges or setbacks that might stand in the way. The Page of Swords can also represent your relationship with a person who is exploring their ability to communicate, share ideas, and gather information. You may have your moments with this Page, as the Swords often express a level of tension or conflict, and this bundle of energy may sometimes prove too much to handle. If you need to, give yourself a break from this person, and return with fresh eyes. They have a lot to share with you, and despite their inexperience, may teach you something about yourself. You need to stay open to their enthusiasm to learn more about the world. The Page of Swords reversed can appear in a Tarot reading when you are holding back from expressing your truth, especially in a public forum. You prefer to express your thoughts and opinions privately or anonymously. Perhaps you like to keep a private journal, or you’re writing a book just for yourself and nobody else. Or, you have a point of view about a public issue but have not defined your message. If you need a little nudge to go public with your ideas and opinions, the reversed Page of Swords might be it. Let go of fear and shout your message from the rooftops! At times, the reversed Page of Swords can mean that you are all talk and no action. Be careful about making promises you know you cannot keep or saying things you’ll later regret. Before making a specific promise or commitment, make sure that you can and will deliver on it to preserve your integrity and reputation. Also, be wary of other people’s commitments to you and put in place measures to ensure that they will deliver on what they promise. This reversed Page can be a ‘know-it-all’ and may try to impress you with big stories of his past and his achievements (which you later find out are big exaggerations of the truth). Reversed, the Page of Swords can also suggest you are acting hastily, without thinking things through. You have a lot of energy behind you but are not using it effectively. Tackle things one at a time rather than trying to manage everything at once. Doing so will lead to more meaningful outcomes. As this Page likes to ask a LOT of questions, the reversal of the card can be a sign that you are annoying others by your constant questioning and challenging of ideas. While you may just be trying to understand a situation or a concept better, there are more constructive and non-threatening ways to go about it. Use sentences such as, ‘Help me understand....’ Be conscious of how you may come across to others and only challenge or question those ideas that are important to you.